Your valuable past support allowed us to grow our mission last year, to truly build a better Illinois by advancing equal treatment and social justice through education, advocacy, and protection of the rights of the LGBT community. 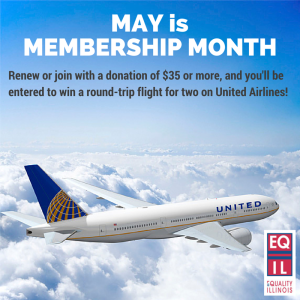 Help us continue our work by donating at least $35 during May Membership Month, and be entered into a drawing for a pair of United Airlines tickets. Educate – We’re educating faith communities on how to advocate for equality and on creating safe and welcoming spaces for LGBT individuals. We’re engaging a wide variety of Illinoisans through comprehensive training of public officers, our “Know Your Rights” educational materials, and our annual LGBT Institute, to name a few. Advocate – This legislative session, we’re supporting over 2 dozen bills including protecting Illinois youth from harmful conversion therapy, irrefutably including transgender people under hate crimes statutes, requiring public officials to receive sensitivity training in civil rights and cultural diversity, and more. Protect – We serve as a vigilant watchdog for discriminatory legislation that is often introduced quietly but could have highly detrimental affects on our community. We protect LGBT Illinoisans in the workplace by regularly working with businesses to maintain affirming and inclusive work environments. Understanding the urgency of our work, United Airlines has stepped up to donate two flight vouchers for travel within the U.S. lower 48 states, Mexico, Canada, or the Caribbean. If you join or renew your membership now with a donation of at least $35, you will get entered into our drawing to win the pair of flight vouchers.